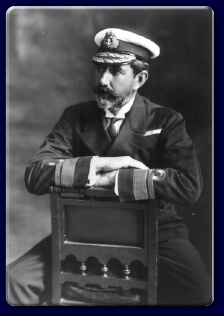 Admiral Sir Charles E. Kingsmill (July 7, 1855 – July 15, 1935) was the first Director of the Canadian Naval Service (which later became the Royal Canadian Navy). In 1908 he was promoted to Rear-admiral and sent to Canada to command the Marine Service of the Department of Marine and Fisheries. With the formation of the Naval Services of Canada, he became the Director of the Services and held this position throughout World War I until retiring in 1921. He was made Vice-Admiral on 17 May 1913 and a full Admiral in 1917. He was appointed honorary aide-de-camp to His Excellency the Governor-General in 1909. He was made a Knight Bachelor in 1918. He was awarded for outstanding services as the Director of Naval Services of Canada 1910 – 1921. He died at his summer home on Grindstone Island, near Portland, Ontario in 1935.